January’s Fan Photos are here! We’ll start with a great photo taken earlier this week while Ben and his family were vacationing at their home in Georgia! Big Ben and his family took a day trip to Georgia Tech to show Benjamin Jr. where his grandpa Ken played his college ball. 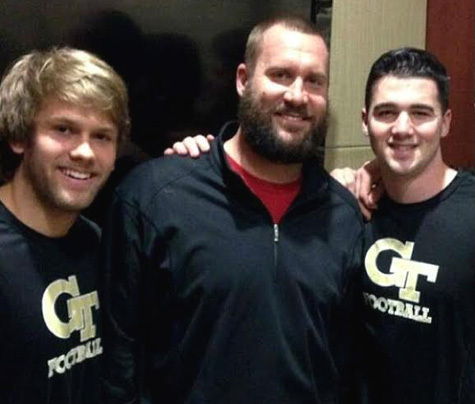 While they were there, Ben stopped to pose with two of GT’s Yellow Jackets, Corey Dennis and Sean Tobin. 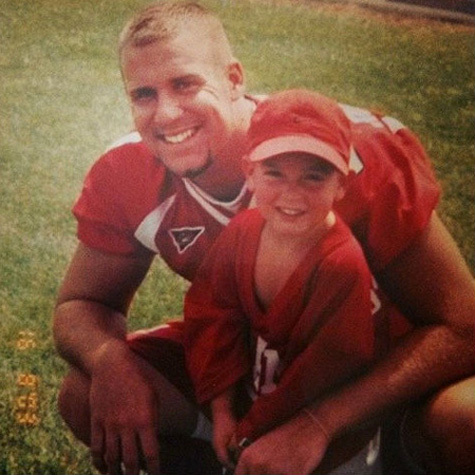 Tanner and Trent’s father, Shane, was the offensive coordinator at Miami University from 2001 to 2005 before becoming the RedHawks 32nd head football coach, succeeding Terry Hoeppner, from 2005 to 2008. He is now the offensive coordinator and quarterbacks coach at Youngstown State University. You can see another pic that Tanner shared with us, as well as some more great photos sent in by Steeler Nation throughout this month – Lil’ Fans, Big fans & one tough lookin’ furry fan, all right here! Oh, and our December Birthday Wishes Drawing winner, Shineque Moore, sent us her photo to add to Ben’s gallery too! You can see all the Birthday Wishes winners here!